Observation - 'Rayburst' apothecia lichen - UK and Ireland. 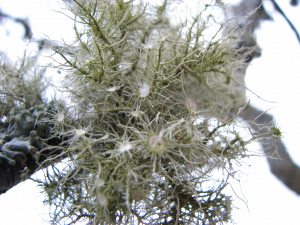 Description: Grey-green fruticose lichen growing on lower branch of deciduous tree. Apothecia have almost white discs and from their rims radiate spines. Small warts just visible on lichen branches (e.g. picture ii). Possibly Usnea florida. Grey-green fruticose lichen growing on lower branch of deciduous tree. Apothecia have almost white discs and from their rims radiate spines. Small warts just visible on lichen branches (e.g. picture ii). Possibly Usnea florida.